The town of Mariposa, first settled in 1849, is the southernmost in the Gold Rush chain of towns. The streets follow the original street grid laid out by John C. Fremont in 1850. Several disastrous early fires convinced settlers to rebuild with stone, brick, and adobe. Consequently, many of today’s existing structures in the historic downtown area of Mariposa had been built by the late 1850s, with most of the remaining ones completed by 1900. Because they have always been in use, the old buildings haven’t had to be restored or recreated. In your travels through the town of Mariposa, you might hear it referred to as the “Mother of Counties.” That’s not meant as a boast. When California was granted statehood in 1850, Mariposa County was by far the largest county, comprising about one-fifth of the state. (It was later subdivided into eleven additional counties.) Soon after, the discovery of gold lured prospectors by the thousands, all with dreams of striking it rich. The easy gold only lasted for a couple of decades, but it lasted long enough for roads and railroads to be built. Communities evolved even as the local economy was shifting to quartz mining, ranching, farming, and logging. Today’s visitors to Mariposa will find many remnants from those early days, from preserved landmarks to obscure ruins—all of them a testament to the county’s fascinating past. Change has come gracefully to Mariposa. Mariposa has retained the small town charm of a bygone era, so you won’t see strip malls or chain stores, and Mariposa remains one of a handful of California towns without a stop light. With Yosemite National Park in Mariposa’s backyard, tourism played a role as far back as the 1870s, though it didn’t really take off until automobile travel did too. Nowadays, about four million people visit Yosemite National Park each year. Over the years, the county has become host to a wide variety of popular annual festivals. Whichever month you arrive in, you’re bound to find something fun going on. 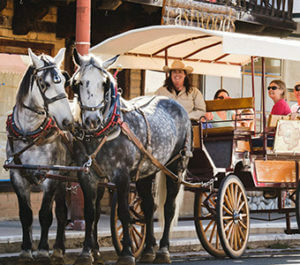 Feel the Old West as you stroll up the historic main street or take a tour of the 1854 courthouse, the oldest courthouse west of the Rockies still in continuous operation. Experience pioneer history in the exhibits at the Mariposa Museum and History Center named one of the best small museums in America by the Smithsonian Institute. 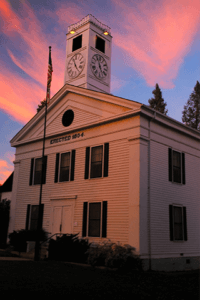 Completed in 1854, the Mariposa County Courthouse is the oldest superior courthouse west of the Mississippi and the oldest courthouse in continuous use west of the Rockies. Feel free to take a peek inside during normal business hours. (Naturally, security checks and rules of appropriate behavior are in effect.) Free to the public. Call 866-HALFDOME to set up your tour. Get a fascinating glimpse of California’s mineral wealth, colorful history and geologic diversity at the California State Mining and Mineral Museum. The State’s official collection contains over 13,000 gems, minerals, and mining artifacts, including the “Fricot Nugget,” a rare and beautiful 13.8-pound piece of crystalline gold found in the American River in 1864. Visit www.parks.ca.gov. Click HERE to get a Town map of Mariposa.